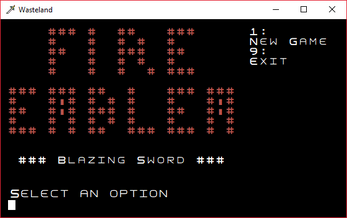 Wouldn’t Fire Emblem 7 be amazing if you could play it via a command-line? 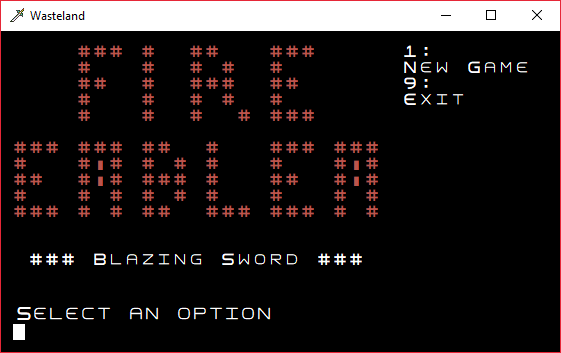 Wasteland is a proof-of-concept demake of Blazing Sword, featuring the first four maps from Lyn's story in a thrilling ASCII rendition. Q: So this is based on FE7? Is there a ROM somewhere in there? 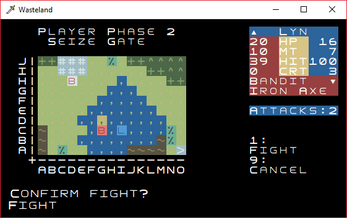 A: It is based on FE7, but I have reverse-engineered every single piece of code in this darn thing from scratch! It took me over 100 hours to get to Wasteland v2.0.0, and if you’re reading this and we’re past v 2.0, it’s taken some time longer as well! Q: So what is it written in? A: The engine code is C# and compiles into a .dll. The UI is a Windows Forms application, also written in C#. Friends, take it from me – don’t write games in a Windows Forms application. A: Proved more trouble than it was worth, given the medium. Sorry! Though to be fair, it is a copy of Lyn Hard Mode, which disables the tutorial anyway. Q: So how much of FE7 are you going to remake? A: For now, only the 4 stages currently available. I had made a poor choice by limiting the game area to exactly 15x10 and decided I’d stop before the first chapter that is a larger size than that (the 5th map, chapter 4). This isn't insurmountable, but combined with the murky legal area of reverse engineering an existing game, I'm probably not going to go any further than that. This is pretty cool, too bad you can't do the whole game. That would have been interesting.